Extract from Entwistle by Clive Walsh, Chapter 3.3, pages 20-24. In the Protestation returns for Entwistle of 1642 (Appendix 1) only two Brandwoods are listed: Oliver, grandson of Oliver Junior of Entwistle Hall, and his son Roger. In the Hearth Tax records of 1663 for Entwistle (Appendix 2), two Brandwoods are listed: Roger Brandwood, of Wayoh Hall, Lower Crow Trees, with four hearths and John Brandwood (his brother) of Entwistle Hall with one hearth (by this time the Hall had been divided into three parts). By 1657 the Brandwoods had established themselves as prominent local business people in Entwistle. John Brandwood, grandson of Oliver, was wealthy enough to purchase the central part of Entwistle Old Hall from the Tyldesleys in 1657 and the family became the new Lords of the Manor of Entwistle. The first Lord was Roger Brandwood, (1657-1678) and subsequently Roger, his son, (1678-1707), then James Brandwood, eldest son of James (d 1715) followed by Roger, the second son, until 1761. Then Roger’s only child, Ann Brandwood, married Christoper Baron and he became Lord of the Manor. The Brandwoods established a thriving local building enterprise. They contracted to build farmhouses, barns, cottages, loom workshops, roads and bridges in Entwistle, Edgworth, Quarlton, Egerton, Chapeltown, Turton and as far afield as Blackburn, and Westhoughton. In 1690 one of the Brandwoods was living in ‘The Dower House’, or ‘New House’, now ‘Entwistle New Hall’ (2011). ‘I give & bequeath as follows, to James mye eldest sonne two’e Cubboads, onne Presse [chest], thee long table of the house and fourme belonging it, a stoole there, the Chimny P [spits, brasses, fenders, kettles etc] now in thee house with tongues spit & rack belong to it…One great Arke that be in the kitchen laffe [round top large chest]. To Rodger mye sonne one plain Bedsted and bed cloathes belongin itt (Exepting ffeather bed). To every onne off mye children I give ffive shillings apeac I remitt to John Bendwood [sic] mye sonne tenn pounds offe debte he oweth me by bonde; I give Alice mye daughter tenn pounds. I give towards the augmentery of the Chappell stock at Turton off the Ministry there off Thirty Shillings. All goods I give & bequeast to Lawrence & Christopher Brendwood mye sonns & Alice Brandwood mye daughter equaily amongst them divided: I nominate & appoint James Brandwood mye sonne sole executer of this mye Will hoping hee Faithfully execute same as mye Trust in hym reposed. Sealed signed in the precence of - William Horroskes, Christopher Horrockes (his mark), Tom Ainsworth (Aterny) Maie 30th 1679. The total value of Roger Brandwood’s Estate was £834 14s 6d. The full inventory of this will is missing, but J.C.Scholes in 1882 calls it a singular production, being written on a slip of parchment about 1 yard long and 6 inches wide. ‘Sealed Signed and Delivered In the sight and Presence of us- Rodger Brandwood [son], John Brandwood [brother], James Bradwood [brother], Ellin Knowles (Aterny)’. All the executors were illiterate and ‘made their mark’, only the attorney signed. Roger Brandwood died five days later on May 10th 1707, 62 years old and his heirs would have had to pay the equivalent of inheritance tax. John and James were his brothers and John died in April 1740 aged 86. The ages of Roger Brandwood’s children in this will were: Mary 31, James 26, Roger 23, John 20, Cristwell 16, William 13 and Margret 10. James Brandwood would have to look after the three younger children for 7 years until 1714 when Margret reached the age of 17. James Brandwood Sen’r, John Postlewhite (Attorney at Law), John Bendwood his mark (brother), Andrew Knowles his mark. John Brandwood Sen died in 1784. In his will, dated 17th March 1784, he left Higher House Fold to his son John Brandwood Jnr, subject to a payment of £100 ‘to mye daughter Marye. To mye sonnes William and Thomas I leave New House, also part of the land belonging to that part of the Old Hall late owned by Christopher Baron, this plot known as Sanderfield’. John Brandwood junior was overseer of the poor in 1797 and died in 1799. The youngest son James was disinherited because he had joined the Society of Friends! James Brandwood soon took an active part in the affairs of the Society of Friends and for over 50 years was a ‘minister’ of that body. 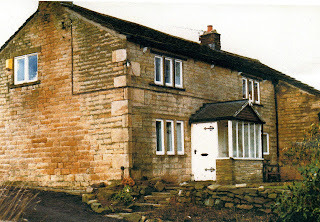 He preached in various parts of the country travelling to the new Rossendale meeting house, to the chapels in Edgworth, Crawshawbooth, Preston and as far afield as Huddersfield to practice his new religion. For this he became an outcast to his family and was excommunicated from St Peter’s Parish Church, Bolton. He was the first to farm Pleasant View Farm Entwistle, called ‘Brandwoods Farm’ on the census of 1801. 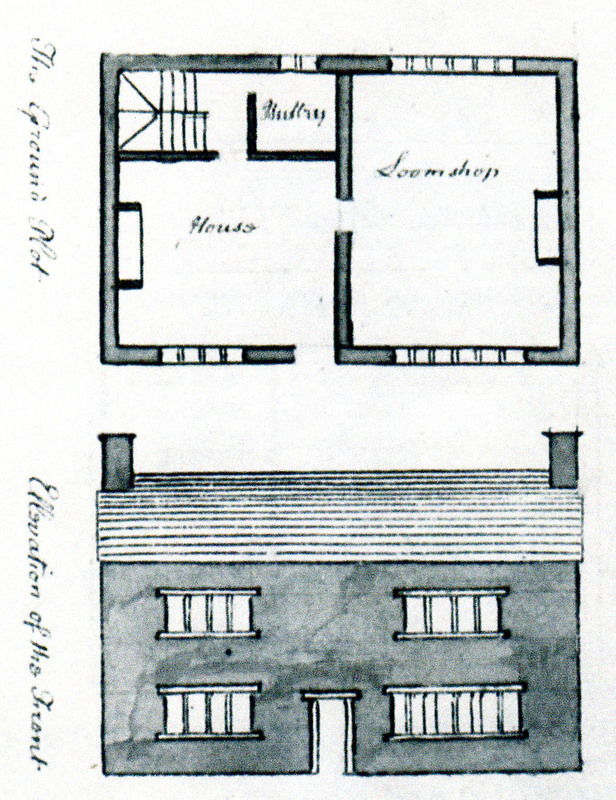 James’s working life was spent as a builder. He was plainly a man of outstanding talent and during his working life kept most detailed account books, containing plans of new buildings, repairs to old ones, road repairs and other sundry matters. A typical example from James Brandwood’s account book reads: ‘September 1805 paid to Mr Yates (Millwright) the sum of £1 3s 4½d, for Water Wheel buckets and repairs’. 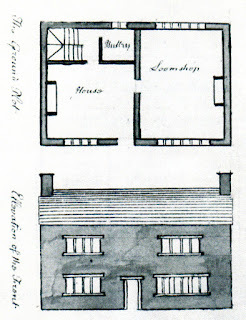 At the time of his death in March 1826 he had made his home in Westhoughton and was interred in the burial ground attached to the Quaker meeting house there.